Notificator customize iOS notifications as you want it to be ! 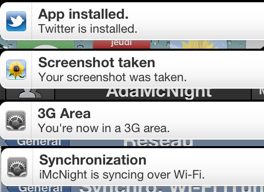 It is a tweak that allows you to get notifications about system events of your device. You can replace existing events like the low battery alert by a less intrusive banner or add new notifications to events like joining a Wi-Fi network, installing an application or even switching to a 3G/Edge area ! This tweak is constantly evolving : email me if you want to add some interesting notifications into Notificator! Works great with SpeakEvents & Aloud ! - Notifications can now appear on the lock screen and in the Notification Center ! - Add an Existing Event : No Data Access Event ! - Add an Existing Event : Wi-Fi Picker Event !